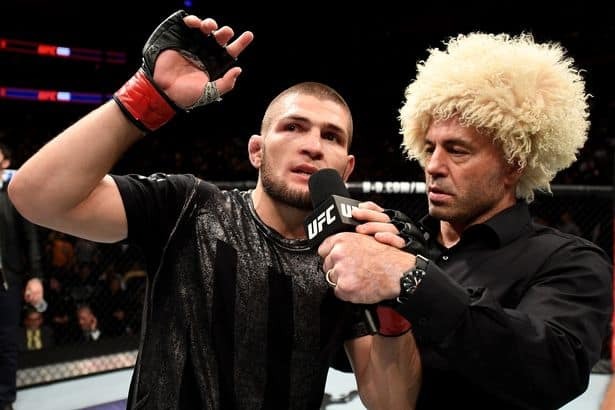 The biggest question mark in the deep UFC lightweight division is when – and against whom – champion Khabib Nurmagomedov will fight again. Joe Rogan has his own idea of what should happen. ‘The Eagle’ is still awaiting his punishments from the Nevada State Athletic Commission (NSAC) for his involvement in the post-fight brawl at UFC 229. Khabib submitted former champ Conor McGregor in the fourth round after a dominant performance. 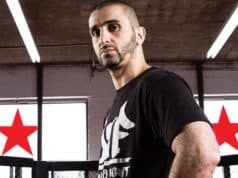 Yet he marred that win by jumping into the crowd to assault McGregor’s teammate Dillon Danis. That has the champ’s fighting future up in the air a bit, and no one knows which top opponent he’ll fight next. The obvious choice is a bout with former interim champion Tony Ferguson. But Khabib’s manager Ali Abdelaziz has claimed Ferguson doesn’t move the needle on pay-per-view quite enough. So an immediate rematch with McGregor has been teased by Dana White for this year, but Khabib has claimed the Irish star doesn’t deserve it. Both of those fights would be absolutely huge for Khabib and the UFC. With champ vs. champ superfights becoming the norm in today’s new MMA landscape, there may not be many better than Khabib vs. Woodley or St-Pierre. “GSP” has repeatedly stated he will only return for fights that further his all-time great legacy, and that one fits the bill. He may even be holding out for just that one fight. As for Woodley, he’ll have to get past Kamaru Usman at UFC 235 on March 2. Then he’s confirmed he will take on Colby Covington after that. He’d probably pass that off to face Khabib, but again, the future is still very much in motion. Either way, Khabib has some great options as Rogan says. We just have to wait and see when he can return.